So you can see I’m a sentimental soul and perhaps that’s what my wife fell in love with, although I sometimes maintain that she loves the music and my violins as much as I. It was strange at first to make such a giant leap but we were aware that we could never bring in enough money every month to start a family and have a decent life. So we wracked our brains and wrote a list of all the things we could do and ways that we could make extra income. It wasn’t a big list yet we were both healthy and strong so we looked for something that would be simple but not too taxing physically. In fact, against the expectations of our family it has turned out well and we are able to tailor our carpet and upholstery cleaning around our shop and private lives. We don’t have to work full-time but find that putting in around 30 hours a week between us brings in enough money to keep us going. The beauty of money is not intrinsic but in the freedom it gives to follow one’s dreams. So tcleaning carpets has allowed us to build our violin shop and the workshop we run alongside. 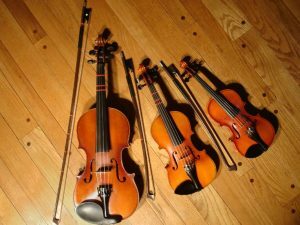 Our violin business is really our hobby and it pays for itself with some profit, but without our other business we would struggle to live. Despite running two businesses, you couldn’t consider us wealthy, yet we have enough income to support our growing family and that’s what is important to us. Our children have learned to play the violin, of course, and they both show some promise in the field. The violin is one of those instruments that needs to be mastered early in life when one’s fingers and mind are flexible enough to cope with the demands of this wonderful mistress. Although I love to play, my skills are not good enough to pass on to our talented youngsters so we employ an expert to get the best from their young brains. And of course they’ll have access to the best instruments so we hope they will achieve their potential. Meanwhile we may have to work harder as carpet cleaners in order to provide the extra funds needed to keep our children professionally tutored to a high standard. It’s a sacrifice we will not begrudge.